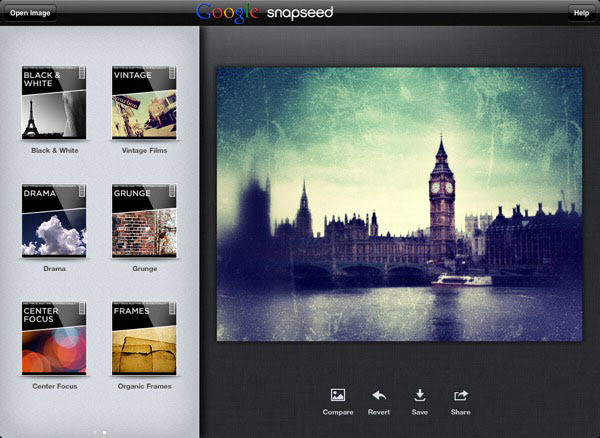 Google finally launched an app called Snapseed in Google Play Store with special integration with Google+. You might aware that Snapseed is one of the award winning photo editing app which is similar to Instagram. When compared with Instagram it is little bit advanced. Yes, it makes the photograph extraordinary with a fun, high quality photo experience right at your fingertips. Now, anyone can enhance, transform and share their photos with ease using incredibly advanced features from the leader in digital photography software. It supports an android OS 4.0 version or later. Further it supports JPEG and TIFF photos. It also supports many languages which includes English, German, French, Spanish, Italian, Brazilian Portuguese, Japanese, Chinese (Traditional and Simplified), and Arabic. It easily adjust your photos with a single tap using auto correct. Further it tweaks your photo to perfection with tune image. It use selective adjust to enhance specific objects or areas in your photos. Experiment with fun and innovative filters like Drama, Vintage, Grunge and Tilt-Shift. Finally, it allows you to share your creations via Google+, E.mail and any other service you have installed. It automatically analyzes your photo and adjust the color and exposure to perfection. It makes the precise selections and enhancements to specific areas of your photos in seconds with Nik Software’s revolutionary U Point technology. Use Ambience to create depth and vibrancy that uniquely adapts to colors and textures. Adjust White Balance, Saturation, Contrast, more. Rotate 90° and/or straighten photos with simple gesture controls. You can easily crop your images to remove distracting parts of your photo with standard aspect ratios, or a free crop.